Van Vleck ISD will be operating on an abbreviated bus schedule until further notice due to flooding and road conditions. Goldfish-Cedar Lane/521 East/Allen Loop/Bell Bottom: Pick up @ Corner of 521 and Bell Bottom Road @ 6:50-5:55 am (We will not pick up on Bell Bottom or Brown Road until further notice. )The rest of the stops will be the same as last school year. 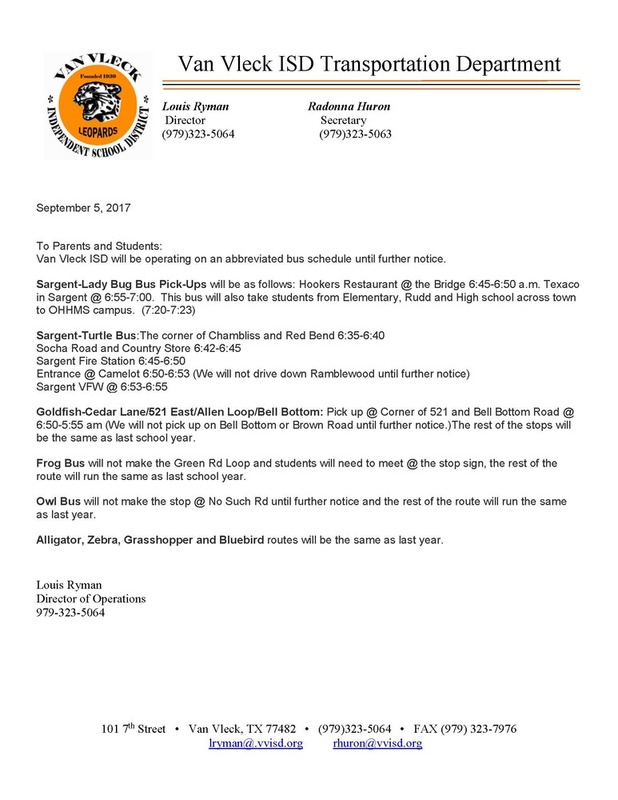 Frog Bus will not make the Green Rd Loop and students will need to meet @ the stop sign, the rest of the route will run the same as last school year. Owl Bus will not make the stop @ No Such Rd until further notice and the rest of the route will run the same as last year. Alligator, Zebra, Grasshopper and Bluebird routes will be the same as last year.